Temporary Distortion is a theater company that’s been around since 2002. Kenneth Collins and William Cusick divide up directorial duties: Collins focuses on the physical set and working with live actors, Cusick designs and executes the video sequences that are crucial to their work. They call their pieces “assemblages” to place them in the realm of art installations or classic performance art, in contrast to narrative storytelling or the text-based plays associated with theater. 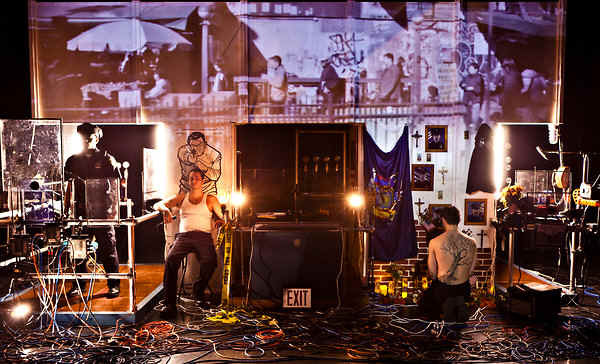 “Newyorkland,” the fifth collaboration between Collins and Cusick, presented in New York as part of Performance Space 122’s COIL Festival, generated a fair amount of attention because it focuses on cops. It’s a tricky choice of subject matter because American pop culture is inundated with movies, TV shows, and crime novels relentlessly circulating familiar images, stories, and tropes about police work. Collins and Cusick attempt to contrast the built-in melodramatic heat of police procedurals with the aestheticized cool of visual art strategies. The performance, which runs about an hour long, takes place on an elaborately constructed multimedia box with three stations that call to mind both Joseph Cornell boxes and the niches in churches that hold religious icons. The panels between these stations and across the top of them become projection screens for a continuous feed of stills and video, some of it stock footage but most of it staged and filmed for this production. A parallel audio mix (with original music by John Sully) contributes to the density of information and sensation. We hear snatches of stories and conversations and monologues from all three sources – actors standing at microphones, voiceovers by unseen commentators, and people being interviewed or witnessed on film. There’s some philosophizing about the nature of police work. One cop mentions going into the profession to help people, only to find himself regulating behavior. “We all bridle at control, do we not?” he muses. Some film sequences seem to represent the mundane cityscape viewed from a police cruiser. Others focus on the adrenalin-pumping mixture of chaos, violence, hysteria, and blood that make cop shows at once so popular and so numbing: a drugged-up detainee going berserk in a precinct office, a pair of officers following up a complaint about neighbor-harassment, a hostage situation being defused. But lots of the piece is simply texture – a song in the dark, a monotonous recitation of department regulations, banal interior monologues (“I feel hollow”), an interview with the wife of a cop. Of the four performers (Nick Bixby, Daniel Brown, Al DiMartino, Brian Greer), I found myself almost always attentive to Bixby. After a long impressively voluble spiel on film, the live actor peels off his mustache, hat, gun-belt and shirt and starts unpacking materials from a cardboard file box to build a shrine to what looked like cops killed in the line of duty. I could see that Collins and Cusick have absorbed many of the artistic preoccupations of their peers and predecessors in downtown theater – the tech-savviness of the Wooster Group and Elevator Repair Service, the deadpan delivery of Richard Maxwell, the visual art interface of Mabou Mines, the commitment to field research of the Civilians. But when the piece was over, I felt let down. For all the evidence of skill and craftsmanship and artistic choices being made, there didn’t seem to be any point to the piece, any personal burning insight, or any particular added value to the shuffling around of popular imagery about police work. This is perhaps the liability of any kind of non-narrative art work, whether you call it poetry or collage or assemblage – in the attempt to avoid saying something obvious, you run the risk of saying nothing at all.